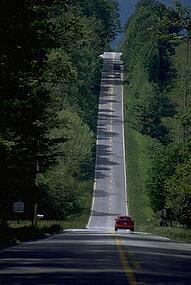 New drivers will quickly realize that not all roads seem to follow the rules. In this post, we’ll Go Ahead and give you some quick tips that can benefit both the experienced driver just as much as those fresh out of driver's ed. Normally the easiest way to tell if what you’re looking at is a driveway or a road would be the existence of lane markings and street signs. This, of course, is an ideal. Signs can be non-existent, covered in graffiti, knocked down, obscured by foliage, or stolen. 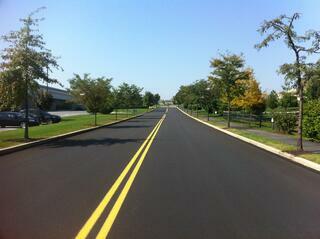 Lane markings can be poorly applied, worn off, or hard to see. One of the easiest ways to discern if that turn-off is a driveway or a new street would be to take a glance at the center line on the road you’re currently on. For side streets, that center line will have a break in it. It will remain solid if it’s just a driveway. Those of us who have driven in New York City, Boston, or any other city can readily attest to the annoyance of one-way roads. They are the bane of most GPS systems, and after driving down the wrong way once you’ll never want to repeat the harrowing experience. One-way roads will often be narrower than others and lack a center line. 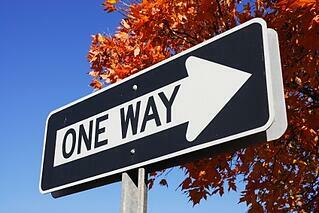 Keep a sharp eye out for their ubiquitous “One Way” signs, regardless of where your GPS is telling you to go. Apps and technology are nice, but here at The Next Street we say that the greatest tools you can utilize while driving are your own skills! This isn’t always the case, and on larger roads the center line will be white to indicate that traffic is heading in the same direction. On smaller roads the same rule applies, except pertaining to the edge lines both being white, whereas normally one would be yellow. What is the point of one-way streets? Sometimes it’s for practicality reasons: the road built is simply too narrow for two cars to travel abreast. Otherwise, however, the original thinking that one-ways keep traffic flowing is being challenged, especially in cities where they can lead to confused and agitated drivers getting lost. Driving on a steep hill is usually a simple matter of keeping an eye on your speed: you can build up a lot of momentum without meaning to. Visibility is your greatest enemy going up hills, however. “Riding your brakes” – most folks in the US drive automatic transmission cars. When it comes to steep hills this means judicious use of your brakes to maintain speed, and therefore control, of your car. Remember, you’re never allowed to go over the speed limit: it’s there so you’ll have enough reaction time in case of an emergency! Downshifting - if you have gotten driver training on a manual transmission vehicle (commonly called “driving stick”), your speed on hills can easily be regulated with downshifting: putting the car into a lower gear, such as first or second, to restrict the car from going too fast. This can also be done in most automatic cars as well. In first, a car can often not go faster than 15mph. This technique can be (technically) harder on your engine/transmission, but will save your brakes. Visibility up hills – when you’re creeping up a hill, normally speed isn’t much of a concern as you can’t build up too much anyway. The crest, or top-most part, of a hill can prove to be a problem, however. You can’t see past it, and can’t see what’s waiting on the other side. Slow down before cresting a hill. You never know what or who will be on the other side. 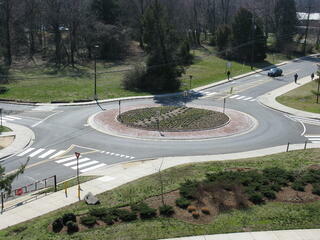 Traffic circles, or roundabouts, started in Europe and are gaining traction over here in the states. They are both more theoretically fuel efficient and traffic-reducing than more traditional intersections. Traffic goes counter-clockwise in a traffic circle. Traffic looking to get into a traffic circle must yield to traffic already in the circle. This means traffic to your objective left has the Right of Way. Use the outer lanes (if they exist) if you are planning to exit right away. Use the inner lanes (if they exist) if you are planning to leave at one of the later exits. DON’T PANIC! If you miss your exit, simply continue through the circle and attempt again. KEEP AN EYE ON THOSE BLIND SPOTS! Remember that entrances to many roundabouts are also crosswalks: be on the lookout for pedestrians of all shapes and sizes. Side roads will see the center line “break” to reveal what they are, as opposed to driveways which will have the center line remaining solid. 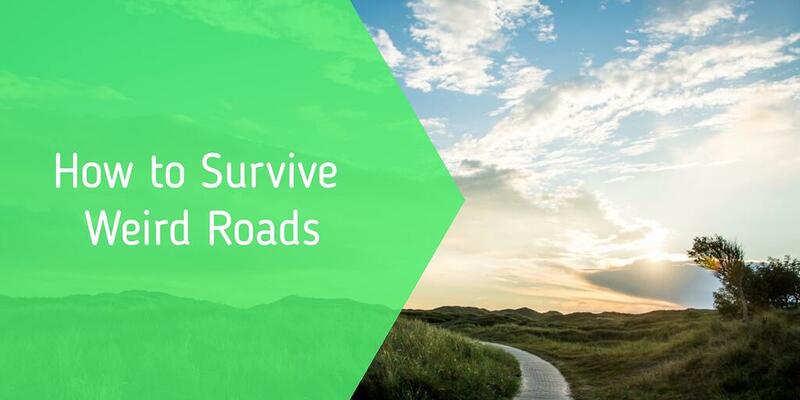 When driving around a lot of one-way roads, keep an eye up from the GPS! Often their maps won’t account for one-ways and can lead to some hairy situations. Slow down before cresting a hill. You never know what or who will be on the other side. Yield to traffic on the left when entering a roundabout, and keep an eye on your blind spots! Always use your best judgement when coming up on a strange or non-traditional road. With these tips you can get a head-start on driving like a champ. How confident are you in your driving ability? Brush up on your skills or get a refresher with one of our Private Driving Lessons at The Best Driving School in Connecticut!